Spanish marmalades are one of the most foods consumed by its inhabitants. In Spain we have a long tradition of making jams and this is the reason why Spain has a unique and wonderful jams. As from the 17th century, recipes for jams figured largely in cookery books. The invention of preserves in the 19th century led to the industrialization of many artisan jam-making processes in the main fruit-growing areas such as Murcia, Valencia and La Rioja. Quince paste is a thick jelly made by cooking the quince flesh with an equal amount of sugar. Cut into thin slices and spread over plain toast or toast with soft or cream cheese as Tetilla PDO or Arzua-Ulloa PDO cheese. 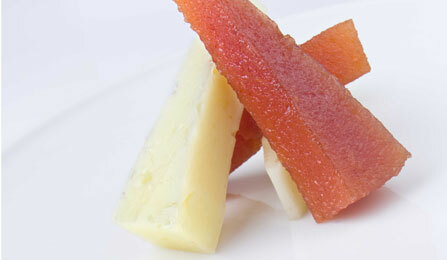 Also serve it with Manchego PDO cheese to have a salty contrast to the sweetness of the quince paste.